You’ve designed an Activewear collection … Now what? Activewear isn’t just for exercise anymore. In fact, sports apparel just might be termed “sportswhere” for the variety of places that customers wear it. It’s estimated at around $58 billion in the US, with athletic footwear representing 29% and apparel representing 71% of the total market. This is a prime area of the fashion industry to launch your new company. The need for premium, lightweight, performance-driven technical activewear that is built for practical use such as snowboarding, yoga, cross fit, and dance apparel is evergreen. A lot of active brands may look fashion forward but forget to take into account the garment’s intended use. Therefore, technical activewear has an opportunity to make a mark – another great opportunity for your new activewear business. Starting an activewear business is more than just creating stylish gym clothes. You’ll need to understand the operations of a dynamic fashion industry and how your activewear brand will expand and thrive in the future. 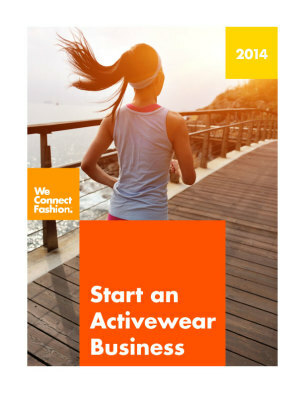 Start an Activewear Business is built by industry experts who have been there, done that. This PDF publication is designed to help you plan your company, produce your product, promote your brand, and sell to buyers.